“No one can point a finger and not have that finger, that thumb pointing back at them,” Rae Ann Wessel said. She’s talking about the brown water running through the Caloosahatchee River and into the Gulf of Mexico. How does she know? She’s worked on water issues in South Florida for over two decades, and currently holds the title of Natural Resource Policy Director for the Sanibel Captiva Conservation Foundation. 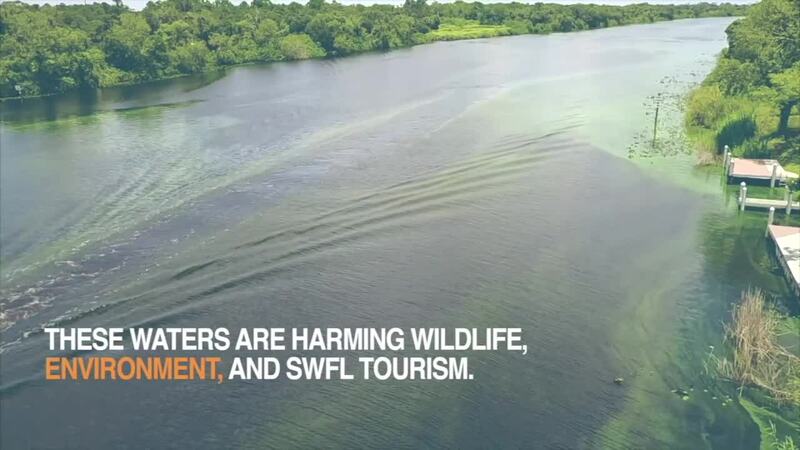 Water releases from Lake Okeechobee have caused environmental and wildlife issues for years, but the dangers lie under the sparkling surface. “There’s a certain level of nitrogen and phosphorous that make water systems productive but we’re far past that level,” Wessel said. Lawn trimmings, fertilizer, plastic and other debris drain down hills, directly into the river. Especially during storms. 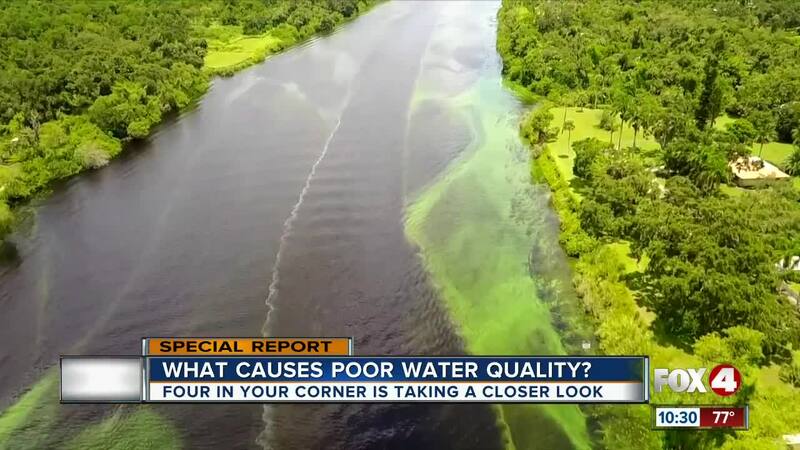 This creates that brown color water we see in the Gulf and the green algae blooms we see on the coastlines and down the Caloosahatchee River. MORE COVERAGE: Photo gallery of water issues in Southwest Florida in summer 2018. “We have algal blooms anywhere throughout this area, including Pine Island Sound, around Sanibel,” Wessel said. “We have an economy as well It’s called tourism. It’s called real estate,” Sanibel Mayor Kevin Ruane said. In fact, the mayor was appointed to a task force in charge of South Florida’s ecosystem restoration. It’s called the South Florida Everglades Restoration Task Force. 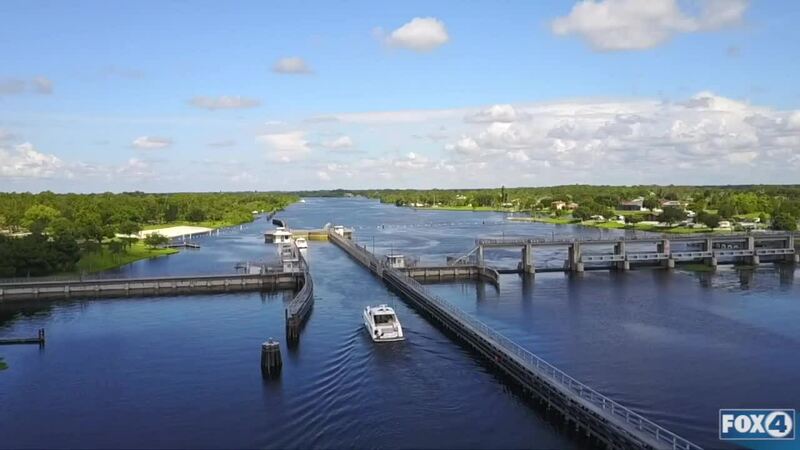 The Franklin Lock near Alva is the last line of defense between the fresh water and the Gulf’s saltwater ecosystem. The U.S. Army Corps recently reduced water flow through the Franklin Lock by 25 percent. Still, this is over what Wessel considers the “harm threshold”. The record levels of rain in May for the state of Florida have added to the increase of water releases down the Caloosahatchee River. One of the main problems is a flood control system that was built in the past. The U.S. Army Corps number one concern? The integrity of the dike and the safe holding of the Lake, but they’ve also been listening to the community. And projects to stop the brown water releases are in the works, including a potential reservoir on the south end of the lake to address water storage. “That one project has the potential to reduce estuary discharges 40 to 60 percent to both estuaries,” Wessel said. The U.S. Army Corps held community meetings in recent weeks around South Florida, to give the community a chance to comment on the future of this project -- which is expected to cost around $2 billion. Florida is expected to pay half of that cost.